wwiivehicles.com. Fair use may apply. Power plant One 510 hp (380 kW) Hitachi Ha-13a 9-cylinder radial engine driving a two-blade wooden propeller. 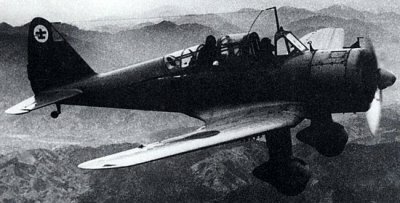 The easy handling the Ki-36 led the Japanese to begin production of a trainer version, the Ki-55. Both were known as "Ida" to the Allies. It was also known as the Army Type 99 Advanced Trainer. All unnecessary equipment was stripped and the observation windows and wheel spats were removed. Army pilots were certified when they performed their first solo flight in a Ki-55. A few Ki-55s were given to puppet governments and three found their way into the hands of the postwar Indonesian nationalist forces.